If you are ready to quit smoking, there is no better time than right now. Every day you do not smoke is a day when you are taking a step ahead. Times are tough, and a lot of people are living paycheck to paycheck. While some smokers may think they need the help of expensive quitting tools, that is simply not the case. 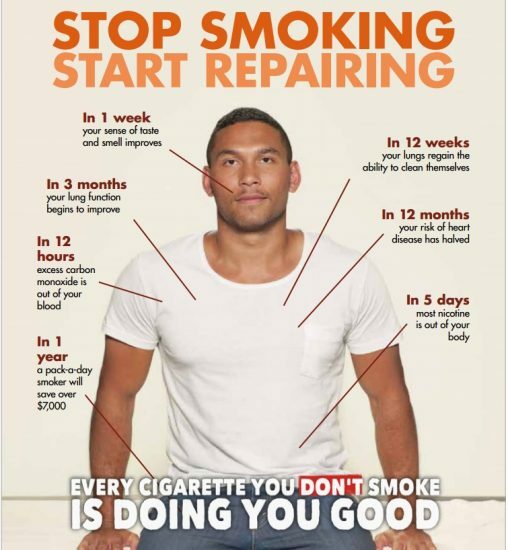 There are many free and low cost smoking cessation program options to utilise. Aside from the obvious health benefits of quitting smoking, reminding smokers how much money they will save by quitting can be a useful tool. If they are concerned by the cost of smoking cessation programs, have them add up how much they spend on cigarettes per week, per month, or per year. The numbers are staggering and may surprise you! You will feel more confident and in control of your life. You will feel like a positive role model for friends and family. You will have whiter teeth and fresher breath. You will have healthier glowing skin and fewer wrinkles. You will no longer smell of stale cigarette smoke. We know that quitting smoking isn’t easy, but with the right tools & quitting advice, you will succeed. For many smokers, giving up smoking will be one of your toughest challenges in life. But it will also be one of your most rewarding. It’s the single best thing you can do to improve your health, your longevity and your quality of life. Once you’ve smoked your last cigarette, the healing starts immediately!